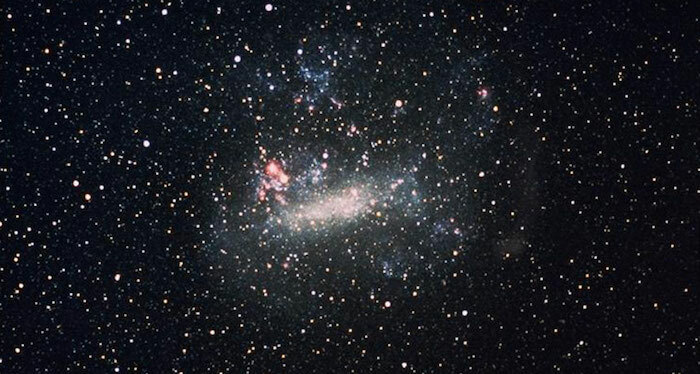 HOT STUFF Head toward the Large Magellanic Cloud, seen in this 1987 picture from the NASA Kuiper Airborne Observatory, to get to the hottest known white dwarf. The heat is on in the outskirts of the Milky Way. A white dwarf sizzling at around 250,000˚ Celsius is now the hottest known member of this class of dead stars, researchers report in the December Astronomy & Astrophysics. This scorcher, designated RX J0439.8-6809, sits about 30,000 light-years away in the constellation Dorado and is about 50,000 degrees hotter than the previous record holder. J0439, discovered more than 20 years ago in data from the ROSAT satellite, first showed up as a smudge of X-rays. Researchers thought J0439 lived in the Large Magellanic Cloud, the largest satellite galaxy of the Milky Way, and might be a white dwarf fusing hydrogen on its surface or possibly a neutron star (the core of a dead massive star) sucking down superheated gas. Astrophysicists Klaus Werner and Thomas Rauch, both of the Eberhard Karls University in Tübingen, Germany, sussed out J0439’s true location, temperature and composition with more recent data from the Hubble Space Telescope.